His friends remind him that Anna sacrificed herself so that Cas could live, not walk around half dead. He knows they're right, but in Cas's eyes, no living girl he meets can compare to the dead girl he fell in love with. Now he's seeing Anna everywhere: sometimes when he's asleep and sometimes in waking nightmares. But something is very wrong... These aren't just daydreams. Anna seems tortured, torn apart in new and ever more gruesome ways every time she appears. If it hadn't been for new friends Carmel and Thomas, Cas and his mother would have packed up months ago after Anna Korlov disappeared. Anna may be gone, but Cas certainly can't let her go. Cas is a ghost hunter, he lurks during the darkest hours for resident ghosts that are intent on harming the living. Cas is determined to find out what happened to Anna that night, when he had confronted the Obeahman and realised that his sacred athame was connected. Each and every ghost Cas had killed, the Obeahman had feed upon, leaving Anna to pull him from the world with her on night her house imploded, with both Anna and the Obeahman inside. Anna didn't leave, she was taken. A tip leads Cas to an abandoned barn, where the ghost is suspected to take the loves of the living, by conjuring accidents. Six deaths in three decades doesn't usually rate on his radar, but now being based in Thunder Bay, ghost hunting's are few and far between. The barn looks ominous, standing alone in a blackened field. Ghosts in nature are shy but curious, so Cas, Carmel and Thomas lure the otherworldly being out. As they explore the barn, the words accidental death fresh on their minds, as Thomas is pushed from the loft. As the young farmer becomes corporal, Cas hesitates in using his knife... The ghost's laughter sounds remarkable like Anna's. Cas must be hallucinating, be he can't let her go without knowing that Anna is at peace. But Cas isn't seeing things, everywhere he turns, he finds a piece of Anna. Her simple white dress in a window display at the mall, standing in the bushes outside of his house, her eyes empty and hollow without any trace of recognition. Each time Anna appears the athame comes to life, a warning beacon making Cas aware of her presence. He feels Anna calling to him, if only he could hear what she wants. Seeking help from Thomas's voodoo grandfather Morfran leads them to a woman who may be able to help them reach Anna, but not without warning. When Cas is tipped off about a ghost who burns his victims, he never expected to see Anna. Disposing of the ghost isn't easy without being burnt, but when Anna floats across the floor towards the furnace, ignoring everything around her and climbs in, Cas will be lucky to escape alive. Cas can't take much more, Anna floating in and out of his life, haunting him, she doesn't speak and doesn't acknowledge Cas. Both Gideon and Morfran both warn that it isn't possible, Anna can't return and that Cas has no business searching for answers... But what is Gideon not telling him? Anna is being tortured and Cas can see that wherever she is, she's hurting and cannot escape. As a last attempt, Thomas and Cas visit Riika, a Finnish witch that may be able to help. Cas has doubts, considering Anna's own mother Malvina was also a Finnish witch. Her own mother cursing Anna and binding her to her house, after her mother brutally cut her throat. Rikka confirms that Anna has been present in Cas's life and the secret to freeing her is through the athame. When Cas is finally able to contract Anna through an ancient ritual, finally learning where the was sent... And who is there with her. She lives in the dimension with her bones being broken, burnt, cut and killed over and over again. But when she finally speaks to Cas, he knows he'll walk through fire to reach her... And he just may have to. After receiving a photograph sent from London, robed beings at an alter with identical knives to Cas's Athame, calling themselves the Order of the Biodag Dubh, or Black Dagger. His only hope is Gideon, and Thomas and Cas fly to London on a whim to catch him by surprise. But they didn't expected to be accosted by Jestine, a young fiery witch with a story to tell. Gideon is hell bent on sending the two boys home, but the moment they arrived, his father's oldest friend's hands were tied. Cas's life is now in the hands of the Order of the Black Dagger. But just how far will he go to save the dead girl he can't imagine his life without? 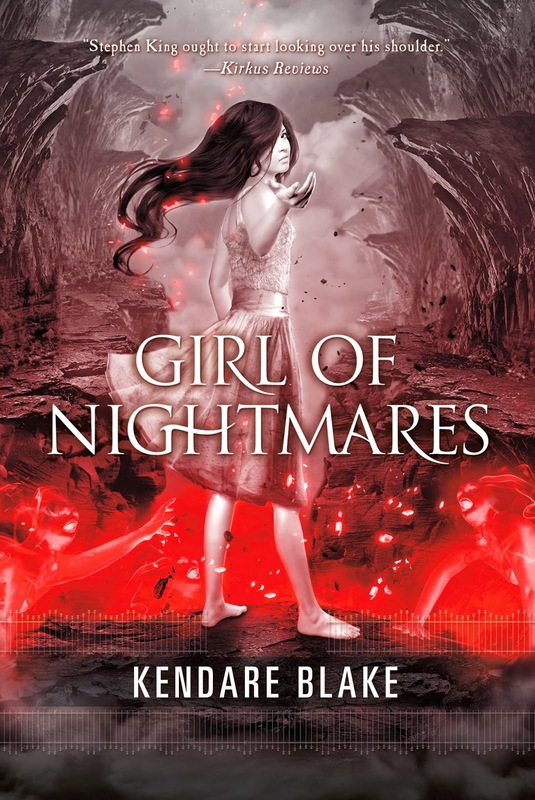 Girl Of Nightmares is the second installment in the Anna Dressed in Blood series. After Anna saved the lives of Cas, Thomas and Carmel, no one knows what happened to her, but Cas is determined to give Anna her happy ending. 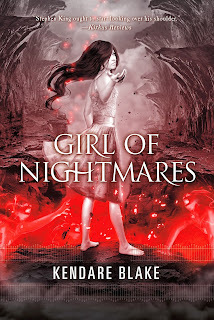 Sadly, Girl of Nightmares didn't live up to the hype for me, it was good, but not as poetic as the original. The original was mesmerising and almost magically, mixed with the horror and gore, it made for an incredible read. I think Anna's ending didn't need revisiting, but I can understand those readers that needed to know what had happened to her, and I'm in two minds whether I regret reading Girl Of Nightmares or not. It's only the storyline, not the actual writing. Kendare Blake is a master at creating a world where the reader is fully submerged, creative and unique. I'm really looking forward to her new release Anti Goddess, the premise sounds incredible. I really enjoyed this one too but the absence of Anna was kind of lame. I think I liked it better than the first one though, less cheesy love scenes. Great review Kelly!